The subwoofer model E15SUB is a horn-loaded 15" subwoofer with integrated flyware. The E15SUB was developed for use with the line array modules EL10 and EL15. With its very high load capacity and a sound pressure of 134 dB, the E15SUB extends the frequency range at low frequencies with significantly enhanced dynamics. 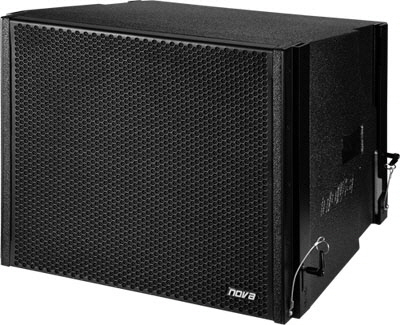 The E15SUB is a subwoofer in a trapezoidal chassis for fixed installations and mobile use. The subwoofer is equipped with one high-performance 15" speaker (3” voice coil), which is hornloaded and compressed by a phase-plug for more sound pressure. The E15SUB can be flown by using the EC1 flyframe. The E15SUB is compatible with all other ELITE models and can be flown together with EL10, EL15, EH10 and EH15. 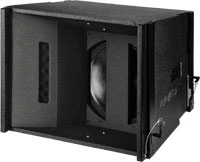 The E15SUB can be also directly stacked onto the E18SUB subwoofer without any adapter or additional frame. The chassis is constructed from 15 mm plywood (birch) and covered with black PolyCoat© finish. The cabinet is equipped with two grip handles and one front grill with transparent charcoal foam backing. Two speakon connectors (NL4) are mounted at the rear side of the chassis for signal input (input) and signal link (link). The power rating of the E15SUB is 600 W (RMS), the impedance is 8 ohms. Line array systems are usually a combination of different technologies. The mid/high frequency range is covered by standard array cabinets. This enables high reach. But subwoofers are mostly based on direct reflecting or similar technologies. This results in different maximum reach and SPL between mid/high and sub/low frequency range. The solution for the same maximum reach along the whole frequency range: The ELITE family is completely based on NOVAs „EHORN“ technology. All models including subwoofers are fully horn-loaded. ELITE systems offer the same SPL along the whole relevant frequency range from 20 - 20.000 Hz. The result is an equable increase of reach.